Fix Windows 10 upgrade graphics card problems - PC Buyer Beware! Numerous problems can occur after a computer has been upgraded to Windows 10 from Win7 and Win8.1. There are several Windows 10 upgrade graphics card problems. This article deals with display problems involving the graphics card and monitor/display. 1. – An error message says: “You may experience problems with the display” or “A graphics problem has been detected” or “GPU not detected” after Windows 10 is upgraded. GPU stands for Graphics Processing Unit. It is the processor of a graphics card that renders the graphics to the monitor or laptop display screen. 2. – There is no graphics output to the monitor or laptop display screen – a black screen – after Windows 10 updates the graphics card device drivers via Windows Update. 3. – There is poor graphics rendering or distortions such as lines across the screen. 4. – While playing video games, especially 3D games, stuttering occurs. Windows Update performs a system examination. It won’t allow a computer to upgrade from Windows 7 and 8.1 to Windows 10 unless it has a separate graphics card (installed in a PCI or PCI Express adapter slot on the computer’s motherboard) or a graphics chip integrated on the computer’s motherboard that Windows 10 supports. That said, device driver problems are still common on systems that upgrade to Win10. After completing an upgrade from one version of Windows to another, updating the graphics card device drivers fixes most problems. What happened is everything was working properly until the Win10 upgrade setup put things wrong. Therefore, all of the problems have to do with Windows and nothing to do with graphics hardware failures. It is best not to allow Windows Update to update device drivers. Note that if Windows 10 needs a driver during the upgrade from Win7 and 8.1, it will use Windows Update to provide it. But in ordinary circumstances, device drivers are optional updates that can only be installed by visiting the Windows Update site. In fact, graphics card problems are frequently caused by Windows Update installing the wrong driver that screws things up. There are many driver update websites. I don’t use them because they are not very good and it’s a simple matter to visit the support website of the graphics card manufacturer (or any other component manufacturer) to download and install the latest drivers. AMD, Nvidia and Intel manufacture most graphics cards (installed in PCI and PCI Express adapter slots on a computer’s motherboard) and graphics chips integrated into a computer’s motherboard (called onboard or integrated graphics). All you have to do is identify the make/model of the graphics card or integrated graphics chip by opening the case to examine the graphics card for its make/model, or, in the case of a laptop, by using a free tool such as GPU-Z. If you can’t see anything on the screen, if you have them, you’ll have to consult the computer’s user manual or its motherboard’s user manual (downloaded from the motherboard manufacturer’s support site) or use another computer to download a manual. It is a worthwhile idea to have the user manuals for a brand-name computer and its motherboard before you upgrade from one version of Windows to another. In any case, those manuals provide useful system information for diagnostic purposes. Here is an example of obtaining the device drivers for the AMD Radeon R7 360 graphics card, costing £83 in September 2016. The process is much the same for obtaining any hardware device drivers. 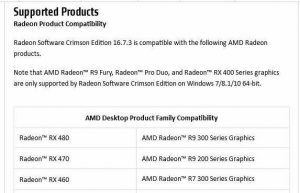 Under Latest AMD GPU Drivers the drivers for Windows 10 divide into 32-bit and 64-bit versions. The choice you make depends on if your version of Windows 10 is a 32-bit or 64-bit version. Most fairly recent computers use a 64-bit version. If you have an old system that has several upgrades behind it, it probably uses a 32-bit version. Here is information on this website on identifying which bit version you have. Choose your bit version of Windows 10. I chose the Win10 64-bit Radeon driver. That Radeon graphics driver supports many models, including the Radeon R7 360 graphics card. 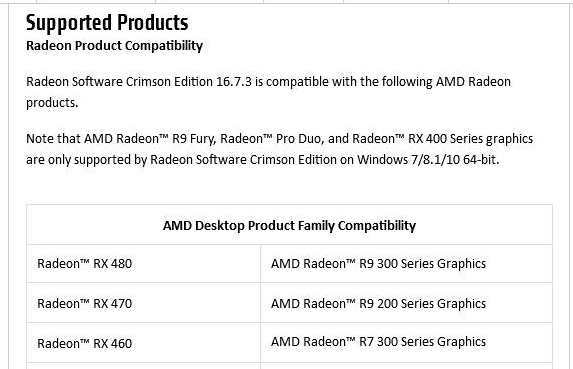 As you can see in the image below the 64-bit AMD Driver supports the “AMD Radeon R7 300 Series Graphics”, among many other series. Installing the driver is merely a matter of downloading it and then clicking on its file to launch its setup wizard. AMD provides driver installation information on the following page. September 15, 2016 in Video/Graphics Card Problems, Windows XP/Vista/7/8.1/10 Problems.